Newcomers to this blog may not know about Discotek.ca’s Feenix project, but will almost certainly have heard about JRebel, the class and framework reloading software. 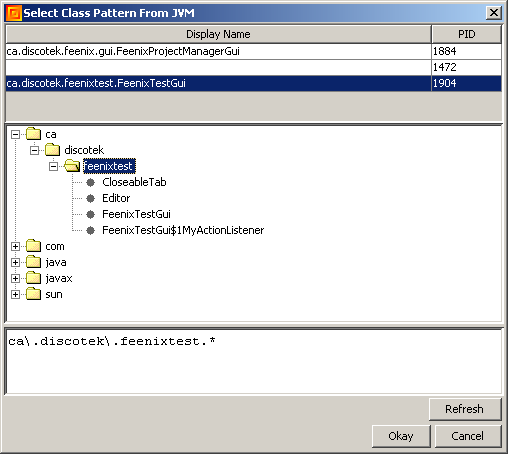 Discotek.ca’s original class reloading project, Feenix, used the Instrumentation API and was vastly inferior to JRebel (further discussion here). 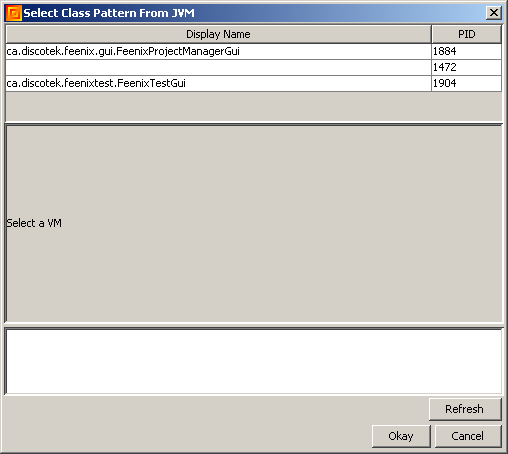 However, Feenix has been entirely re-written and now supports class reloading in a fashion similar to JRebel. Further, Feenix is free and the first beta version is now available! Before I go any further, I’d like to give praise to the original author of JRebel, Jevgeni Kabanov. As I developed this new version of Feenix, I had to overcome many complex problems. Some of these problems were so complex, that I only persevered to find solutions because I knew they had already been solved by others. Not only did the Jevgeni conceive the JRebel approach to class reloading, but solved each problem without the certainty it could be done. Needless to say, I am impressed, but then again, I am no PhD either. The rest of this blog is going to explain a little about the magic behind bullets 2 and 3 in the preceding list, explain how to use Feenix, and show you where to download it. BTW, the first bullet above has already been covered in a previous blog post. You must also instrument every class (within the specified class reloading namespace) such that it has two PhantomFieldHolder fields (one each for static and non-static fields). The rest of the trick involves instrumenting the byte code of any class that accesses these fields. If the field is defined in a give class, access it normally. Otherwise, access it through the PhantomFieldHolder. There is even less magic to adding future methods. We have already seen half of this trick in a previous blog. Specifically, every method is instrumented such that when invoked, it checks to see if there is an updated version of itself. If there is, a special version of the updated class is generated, which implements an interface the original class is aware of (it contains a known invoke(…) method). 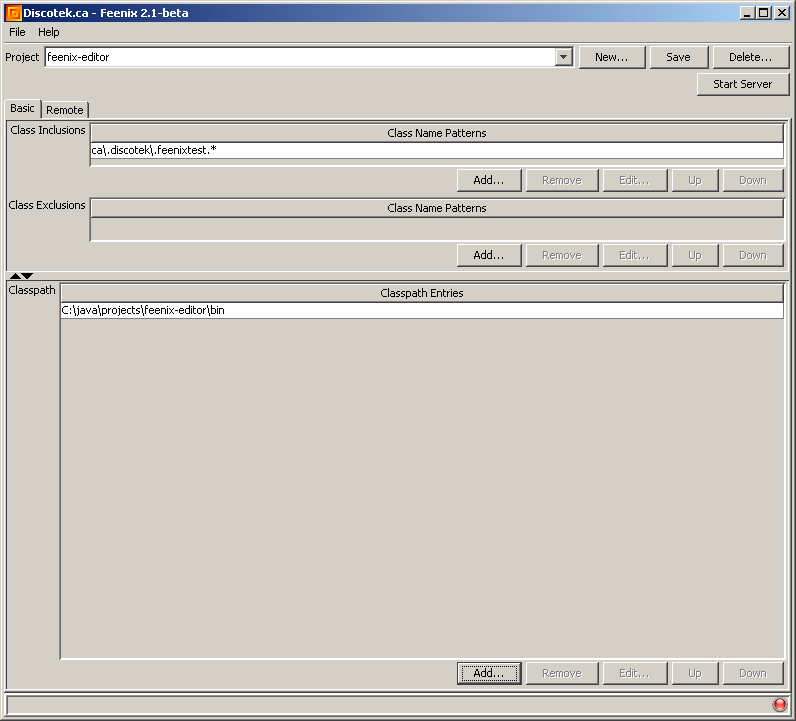 The original class forwards execution via the invoke method. If there is no updated class, it simply continues execution as it normally would. Clever readers may ask, what happens when newer code wants to invoke new methods on an old object? For example, if you instantiated an instance of Car with only an accelerate() method, but later updated that class definition such that it also has a brake() method, how can you invoke the new brake() method on the original Car object? The answer here is similar to above in access fields. Classes must be instrumented such that when invoking a method in a reloadable class, if the method does not exist in the class you are invoking, it must exist in a newer version of the class. Hence, just as above, generate the new special version of the newer class and invoke its invoke(…) method with the appropriate parameters. Admittedly, I am making it sound easier than it is and I am not sure I implemented this functionality 100% correctly, but it seems to work well in my testing thus far. In standalone mode, Feenix will reload classes of a given namespace (e.g. com.example. *) from a provided repository of classes. For now, the repository must be a file system directory. In the near future, jar/zip, war, and ear respositories will likely be added. The project-name property is used by Feenix internally (But make sure the value consists of valid characters for your file system. You may get unexpected results if you use a slash, colon, question mark, etc). The feenix_enabled property allows you to turn off Feenix functionality without having to modify the Feenix configuration or program command line. You may have multiple class_inclusion=… definitions. This property’s value is a Java regular expression which represents the namespace of the classes you wish to reload. The feenix_classpath_entry property defines a directory location where Feenix can find new versions of your classes. You may also have multiple feenix_classpath_entry definitions. Not shown above is the class_exclusion property. It is used to exclude class from the included set. You’ll notice in the syntax above there is an optional -noverify JVM parameter. If you want to have reloadable constructors, you will need to use the -noverify flag. The problem stems from Feenix needing to insert code before a constructor’s required call to super(…). Specifically, Feenix must insert the if there is a newer version of this class, forward the execution etc code ahead of the call to super(…). Inserting instructions in this manner will cause JVM verification errors at run-time. If you don’t include the -noverify parameter, Feenix will not add the required code to reload constructors. Note, the GUI for the Remote Mode below comes with an editor for creating configuration files. 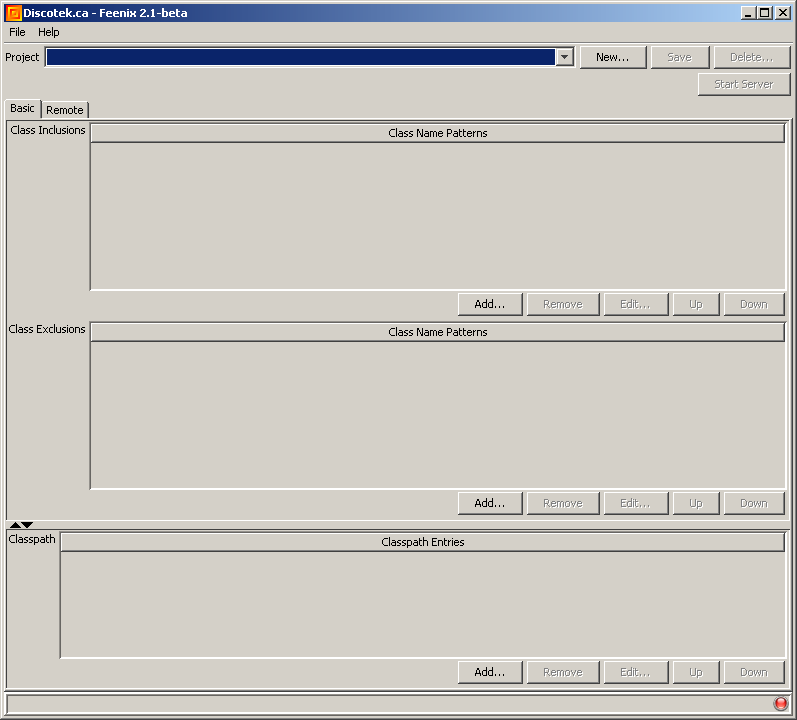 This dialog may provide two options for adding inclusions: Manual Edit and Select from Running JVM. The Manual Edit option is always available, but the Select from Running JVM is only available if you are running ca.discotek.feenix.gui.FeenixProjectManagerGui from a JDK JRE and its <jdkhome>/lib/tools.jar file is on the classpath. You need to add it to the classpath yourself. The command line examples above do not include tools.jar. …shows you the package path expanded such that ca.discotek.feenixtest can be selected and the field below it shows the regular expression to be used as an inclusion. Note, you can select multiple packages and/or classes. Once you click Okay, the regular expression(s) will show up in the inclusion table. You can edit exclusions in the exact same manner as inclusions. When the server is started, it will bind to the address and port as specified above. It will then wait for clients to connect to the server. 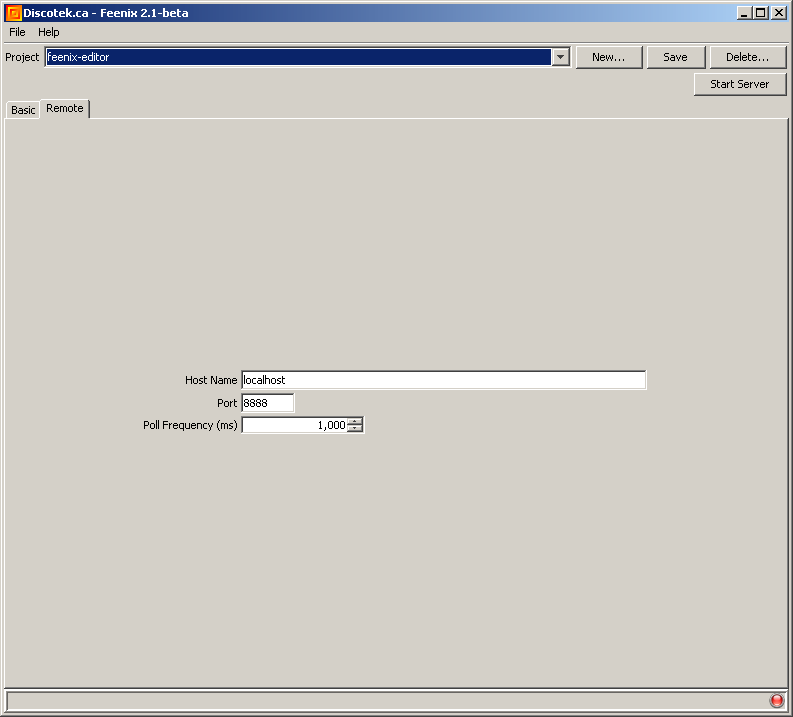 The server will poll the classpath for updates at the specified frequency. When updates are discovered, they will be propagated to each client. However, if you wanted to use the server configuration file to configure the remote client, you can. The remote client will simply ignore polling frequency, classpath, inclusion, and exclusion properties when in remote mode. To this end, you can export the server configuration (File->Export Configuration…) for use on a remote client. If you download Feenix and use its classloading functionality, I have some notes that may be worth reading first. In hindsight, the class inclusion and exclusion properties are probably not necessary and will likely disappear in future versions. Be sure to let me know if you think they are useful. If you want to use the example code provided with the distribution to evaluate Feenix, I suggest you comment out everything except the main method of FeenixTestGui. From there, uncomment chunks of code and recompile to see Feenix’s reload functionality in action. This software has a built-in expiry date of 6 months from the date it was built. This is to ensure that no beta versions of Feenix are kept around. Once the beta is over, there will be no expiry date and builds will never expire (unless there are future beta builds). At this time, I would not recommend using Feenix (standalone or remote mode) in production. Feenix is not open source at this time. It may be in the future, but it will always be free. At this time, Feenix does not handle anonymous inner classes (just name your inner classes so they aren’t anonymous). Stack traces for reloaded classes will look a little strange, but the class names and line numbers they provide will match up with your source code. Remember to use -noverify or otherwise, your constructors won’t be reloaded. Lastly, go easy on me – JRebel has millions of dollars in venture capital and in 2012 had 50-100 developers, but apparently tripled in size in 2015. I am just one dude who starts coding after his wife and kids are asleep at night! You can download the Feenix 2.2-beta distribution here. If you liked this article and would like to be notified of future articles or Feenix releases, follow Discotek.ca on twitter. This entry was posted in Byte Code Engineering, Developer Tool and tagged bytecode, class-reload, instrumentation, Java, jrebel. Bookmark the permalink.